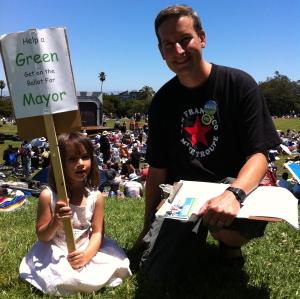 Flouting decades of child labor laws, volunteers for Terry Joan Baum's Mayoral campaign spent the 4th of July holiday gathering signatures at the Mime Troupe's premiere performance in Dolores Park. Greens Celebrate Pride, Launch New Website! Greens celebrated Pride and launched our new website on June 25! In this picture, Terry Baum is collecting signatures to get on the ballot in front of the SF Green Party's booth at Pride, while several volunteers talk to voters. We gathered hundreds of signatures for Terry and registered over 50 new Green Party members from around the state! Thanks to the many volunteers who helped out this weekend, and also to those who designed and built our new website. Green Party Endorses Terry Joan Baum for Mayor! 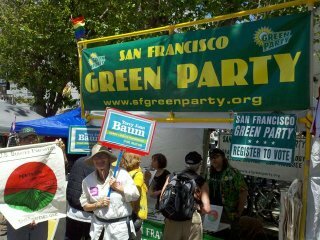 The SF Green Party is proud to endorse Terry Joan Baum for Mayor this year! 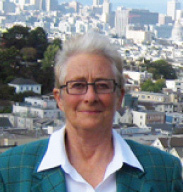 Terry is a pioneer lesbian playwright and long-time Green Party activist. She ran for Congress in 2004 against Nancy Pelosi, becoming the first independent candidate to qualify as a write-in candidate since the Black Panthers did it in 1968.